I racked my brain for a particular story that goes with these cookies. But there’s not one. Maybe because these cookies have just been an everyday fixture in my life, from those days of earliest childhood. My first memory of these cookies was preserved while swinging on a backyard swing set, in those long ago days when I still called Shawnee “home.” I must have been seven or eight at the time. I had a cookie in one hand and a banana in the other, and even now, I partake in the occasional splurge of having this double childhood delight. My mom liked these cookies. They may have been her favorite cookie, though I’m not sure. This cookie is a multi-generational favorite in our family — from Don’s mother Janice, to my daughter Kate and son-in-law Joe to both of my sons to my niece Abigail to my grandson Jackson. And while they may not be everyone’s favorite cookie, I don’t know anyone who doesn’t like them. They stay fresh a long time, which may have accounted for their popularity with the boys. During college dorm years, I must have made 200 of these cookies a month. Perhaps I’m coming into my ‘grandma own’, since this is one recipe I can make without need of words on paper. These cookies became birthday gifts twice this year. And now they become my gift to you, at least with words. From my life to yours. Put 4 Tbsp sugar in a bowl and set aside. In a small bowl, mix eggs, water and vanilla. In another small bowl, combine flour and baking soda. In a large bowl, mix first four ingredients until creamy; gradually add egg mixture and mix well; then gradually add dry ingredients and mix well. Pinch off 2 Tbsp of dough and form into ball. Roll balls in bowl of reserved sugar. 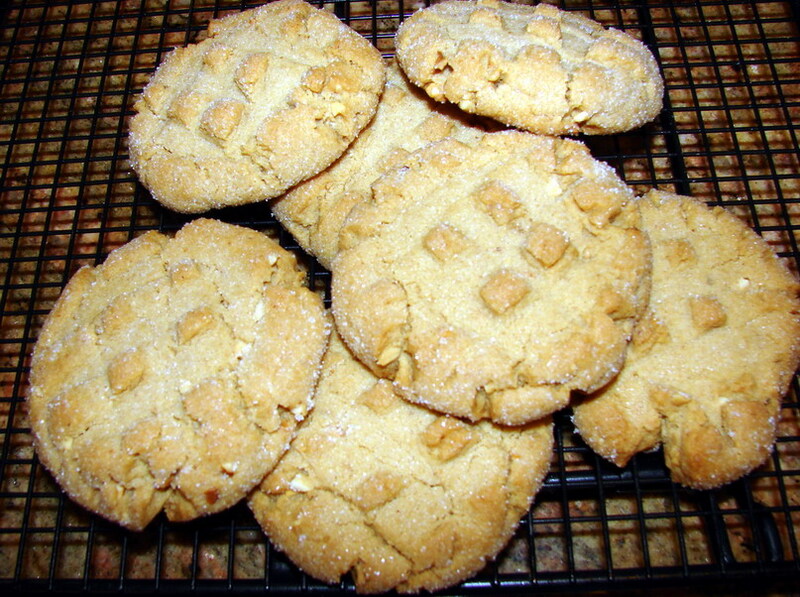 Using a large salad fork, criss-cross each cookie, pressing it down to flatten. The cookies will flatten more in baking process. Bake 10 to 12 minutes in a 375 oven until slightly golden. Cool on baking sheet. I remember you teaching Kate and I how to make these cookies. We would get the job of making the fork marks on the peanut butter cookie dough. Good memories! It’s good to hear you tell about your childhood memories of these cookies. Just goes to show how much they are part of our everyday life. Almost exactly my recipe. The one thing I learned to do was dip a water glass with a buttered bottom into sugar and use that to press the cookies down, rather than rolling them in sugar. It went much faster. I believe I actually picked up that tip from Peg Bracken. She was my kitchen guru waaaaay back when. Isn’t it amazing how our own practices are shaped and fine-tuned by another’s. And often the sharpening comes without any notice. What was once another’s becomes our own. Our cookie recipes, somewhere way back in the family tree, fell out of the same cookie creation tree. But you’ve made your changes (with the help of Peg) and I’ve made my changes to Mom’s recipe with unknown influence by others. One change I made was to substitute the shortening filled version of most peanut butters for a peanut butter that was made only from peanuts. I think this change was probably influenced by my friends Bernice and Laure. But I can’t really say. Good to be here. I’m happy to live in OKC, but thrilled for this chance to call on the sea.